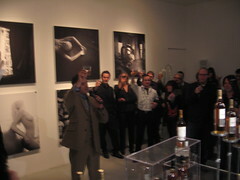 There was no better place than M+B Gallery off Melrose to hold the launch of a collaborative effort between world-renowned, Glasgow-born photographer John Rankin and premium single-malt Scotch maker Macallan. Attendees decked out in black & white complimented large versions of polaroid art mounted upon gallery walls. The first series of Macallan’s Masters of Photography concept yielded a limited edition 1000 bottles featuring Rankin polaroid art labeling Macallan Fine Oak 30-year Scotch Whiskey (a bottle of which would set you back $1695). Owners of the bottles may even register their bottle online with Macallan. No matter. If I couldn’t, wouldn’t buy a bottle myself I’d at least learn how exactly to appreciate premium single-malt scotch. Then and there. And bless those bartenders, who were quite a help. Suggestions made included combinations with ginger beer or honey and mint, or a bit of water. Of course, I couldn’t do the tasting party justice if I didn’t at least try it straight-up, especially the 30-year aged. I’m not a Scotch drinker, but heck if that wasn’t supremely smooth, delicious Scotch. Cheers to that. I am certainly a premium Scotch drinker now! Delicious. And since I am an avid Project Runway fan, of course I became elated to recognize Kit and Jerrell – luckily two of my personal favorites from the multiple seasons over the years. I appreciated that Jerrell seemed just as cool and suited to a projected friendship I may have daydreamed myself having with him one afternoon. Creepy, much? I was lucky to confirm this during a mutual wait with him for the single stall bathroom towards the end of the night. And by the way, if you live in the Los Angeles area, be sure to check out the store on 3rd Street called John Doe Jane Doe featuring his, Korto’s, Leanne’s and Stella’s collections (avid Project Runway fans like me would know those names represent such distinctive styles from each other). The sightings didn’t stop there – I just didn’t quite recognize everyone yet or at all. Like Adrien Brody with his unusually-long beard, Franz Ferdinand, Nick formerly from BRMC, Lisa Edelstein (House) – but of course the home-hitter of the night was Heidi Klum. My girl C had very rarely met another with her height so it’s safe to say she was extremely elated to get a photo op with the German beauty. The h’ors d’oeurves served were top-notch, as well – with only Macallan Scotch in mind as each one was a delicious pairing. Or, Macallan Scotch was actually used in the reduction. An example was poached pear with gorgonzola cheese atop a wafer. For sweets, tiny little crÃ¨me brÃ»lÃ©e dishes and mini pecan pies really complimented the brawn of the Scotch. Unfortunately my mouth worked harder than my camera when it came to food that night so you’ll have to take my word for it without any pictorial help. Not without trying our hand at conversing with Rankin. And how fun that was. About half the polaroids in the collection featured a very beautiful blonde and we had to know just who that was – so we asked. Of course it was his girlfriend. We gave him his due congratulations perhaps a bit in the fashion of a boys’ locker room (Did I mention C and I work in a “boiler room?”) and he laughed. He told us we were funny. And then we were satisfied – that a world-renowned photographer approved of our overall sense of humor. Awesome. Afterwards, we headed off to some shoegaze at The Viper Room to see Morning After Girls. What a great night for the senses! Endless thanks to Elise of LAist for the invite. 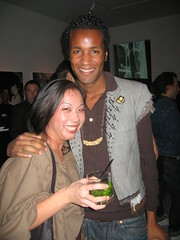 This entry was posted in Events, West Hollywood and tagged Klum, Macallan, Masters of Photography, Rankin, scotch, tasting. Bookmark the permalink.